One of the most effective and simple tools to find the trend is the Moving Average. When it comes to applying moving averages in trading in the live market, the traditional understanding of them will not effect. To find the right strategy in different time frames for the different instrument is important for a trader. Moving Averages gives a fair idea about the trend in different time frames. The webinar tries to elaborate on trading strategies based on Moving Averages with a combination of one or two basic indicators. 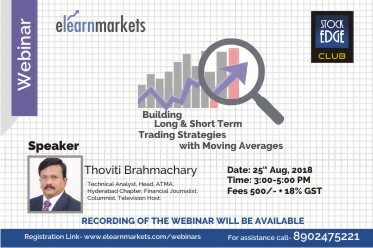 The webinar will focus on understanding the importance of Moving Averages to build a strategy. The participants will learn to build the strategy based on Moving Averages according to their capital, psychology, style. Mr. T. Brahmachary is a renowned Technical Analyst, Television Host, Financial Journalist. He has over 25 years of experience in analyzing stock markets. He has been practicing Technical Analysis since 2000 and trained over 4000 traders across India. Currently, he is the ATMA Hyderabad Chapter head and associated with Namasthe Telangana Daily Newspaper as Business Editor. He has been closely following and reporting economic reforms and market forecasts in various newspapers, magazines and electronic media. He holds three Masters degrees in various disciplines - Journalism, Political Science and Business Administration along with a PG Diploma in Financial Management.